Because this is the 150th anniversary of the Civil War, much attention is being paid to historic landmarks, battlefields, and relics pertaining to the momentous event. Sadly, some are in danger of becoming extinct. One such place is the Magee Farm. 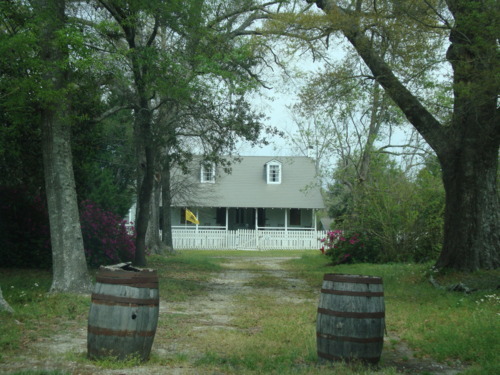 Also known as the Jacob Magee House, the structure, built in 1848, is located in Kushla, Alabama near Mobile. On April 29, 1865, one of the final events of the War Between the States happened here. Confederate General Richard Taylor made preliminary arrangements for surrender to Union General Edward Canby. The ceasefire took place nearly three weeks after General Robert E. Lee surrendered his troops to Union General Ulysses S. Grant at Appomattox Court House.Taylor’s troops of approximately 47,000 men were the last Confederate forces east of the Mississippi River. 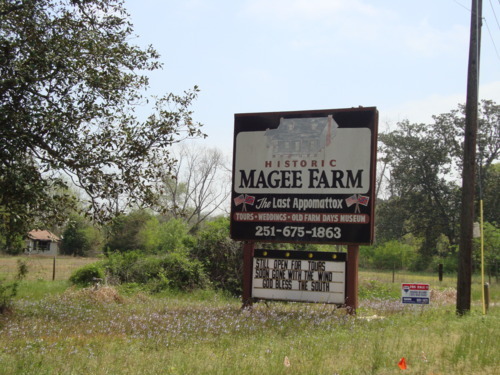 The Magee Farm was listed on the National Register of Historic Places on February 11, 1988. Because of dwindling funds and interest, it was listed for sale last year. It is also listed on the Alabama Historical Commission’s Places in Peril. The purchase takes place only weeks before the Gettysburg National Military Park kicks off events commemorating the 150th anniversary of the Civil War. The land is located on the Chambersburg Pike west of Gettysburg, which saw heavy fighting between Union and Confederate troops on the first day of the battle. The land was previously owned by the now-closed Gettysburg Country Club. Gettysburg Battlefield was recently listed as one of the ten most threatened Civil War battlefields. Therefore, the National Park Service, which has been trying to obtain the land for years, feels that the purchase is a major victory in its preservation efforts. We’ve all heard of cruises to the Caribbean, or to Nassau or Alaska. It is estimated that 150,000 people go on cruises each year. Cruise lines such as Carnival and Holland America take tourists all over the world, from Florida and Hawaii to the Mediterranean and Australia. For something new, interesting and different, check out www.insightcruises.com/history. The Great American Cleanup is now in progress, taking place nationwide from March 1 through May 31, and Civil War battlefields are no exception. The Civil War Preservation Trust (CWPT) is sponsoring similar events that will take place at battlefields across the nation. Volunteers will be marching in, attacking weeds and trash while armed with paintbrushes and trash bags. Not only will battlefields be cleaned up, but shrines and cemeteries will be targeted as well. The event is being called “Park Day,” and has received a grant from History (formerly the History Channel). Around 100 historic sites in 23 states are slated for cleanup. On the Confederate side, six of the 425 generals were Irish. Patrick Cleburne saw the South’s plight as that of Ireland’s in that the Union refused to allow secession, just as Britain disallowed Irish independence. General Cleburne, who would be celebrating his birthday today if he were alive, distinguished himself as a brave and innovative leader. Other notable Irish commanders included General Philip Sheridan, General George Armstrong Custer, and John Barry, father of the American Navy. During the course of the War Between the States, approximately 2.2 million men fought for the Union, 150,000 of which were Irish. In comparison, around 900,000 enlisted for the Confederacy, with 20,000 to 40,000 of these men being of Irish decent. The Irish played an important part in music as well. A popular song of the time, “When Johnny Comes Marching Home,” was written by Patrick Gilmore, an Irishman. On this date in 1861, Arizona seceded from the Union. This event was unique because, at that time, Arizona was still a territory, and didn’t become a state until February 14, 1912. (It became the 48th state, and the last contiguous state.) In March 1861, Colonel John R. Baylor (CSA) defeated Union troops in Arizona and New Mexico. Jefferson Davis then annexed Arizona, making it Confederate territory. Baylor became governor the following January. He established a government with its own constitution. Arizona had requested territorial-ship numerous times, but had been turned down by the U.S. government. However, the Confederacy immediately recognized it. General Carleton (USA) and the California Volunteers recaptured Tucson in June 1862, reclaiming the territory. And on February 26, 1863, Arizona became a territory belonging to the Union. A major battle between the War Between the States took place between Tucson and Phoenix on April 15, 1862 known as the Battle of Picacho Pass. The site where this battle took place is one of the most endangered battlefields, according to the Civil War Preservation Trust (CWPT). Ironically, debate exists as to whether Arizona will be the first state to secede now. This debate centers on the state’s decision to pass their anti-immigration law, which some say is racial profiling. Arizona’s decision takes the initiative for states rights over a unified government. Could Arizona be the first to secede (this time)? We can only wait and see. This weekend, a living history re-enactment will take place at the Andersonville National Historic Site in Georgia. The event will feature prisoners, guards, and the grim living conditions that took place at what was originally known as “Camp Sumter.” Two authors are also slated to attend. A candlelight tour of the cemetery is planned for Saturday evening. There is no admission fee, but reservations are recommended. More information is available at www.andersonvillegeorgia.com. Andersonville has acquired the most notorious reputation of all Civil War POW camps, although such atrocious camps existed in the north as well. Prisons on both sides combined totaled three dozen, ranging from Texas to New York. Andersonville was built to hold 6,000 men, but swelled to over 45,000. Prisoners had to endure rancid conditions in all kinds of weather. The prison was plagued with disease, vermin, contaminated water, and attacks by fellow inmates who called themselves “Raiders.” Over 13,000 perished, and during the summer of 1864, 100 prisoners died every day. Andersonville’s commandant, Captain Henry Wirz, was the only Confederate to be tried and hanged for war crimes on November 10, 1865. The site is located on Georgia Highway 49, approximately 10 miles northeast of Americus and 10 miles south of Oglethorpe. Andersonville National Historic Site is a unit of the National Park System. It includes a reconstructed section of the prison, many monuments, (among trees with cavities dug at their roots by POW’s for water or escape) and a museum which houses artifacts and is sectioned off to display and honor POW’s from other American wars. Andersonville is not an easy place to visit, but is a standing reminder of the horrible conditions that prisoners of war were forced to endure. Are you kidding me? If anything, such a statement is an example of hatred and bigotry. If Mr. Mongo is implying that the flag is associated with the KKK, then he’d better boycott the American flag as well, since it is also used by the KKK. And in an even more interesting twist, top officials of the NAACP refuse to acknowledge Mongo and his followers, stating that Kid Rock deserves the honor because of all he’s done for the city of Detroit. Kid Rock will receive the Great Expectations Award on May 1 at the Cobo Center. He was unavailable for comment, but previously said in a 2008 interview with the Guardian in Britain that he considers the flag to represent Southern rock and roll. You go, Kid Rock! As for the NAACP protesters, your over-reaction to the Confederate flag is becoming tiresome, and makes you look ridiculous. Please find something more worthwhile to protest. Today marks the 150th anniversary of Abraham Lincoln’s first inauguration in 1861. Prior to the event, the new president-elect wrote his speech while still in Illinois. A copy of the first draft leaked to a local newspaper. Because of threats to his life, Lincoln was smuggled into Washington via a secret route. Once there, he allowed a few to see the draft and offer suggestions. William H. Seward, the new secretary of state, suggested that Lincoln soften the message and include the famous ending. Kinder words proved to be futile: a month later, the Confederate army fired upon Fort Sumter. Lincoln seemed to defy danger during his presidency, and his inauguration was no exception. He rode in an open carriage to the Capitol Building with President Buchanan. Chief Justice Taney, who ruled on the Dred Scott Case, administered the oath of office. Lincoln was the first president to be elected under the newly-formed Republican party, and the first to be elected on an anti-slavery platform. “One section of our country believes slavery is right and ought to be extended, while the other believes it is wrong and ought not to be extended. This is the only substantial dispute,” he stated. Interestingly, this wasn’t the truth. There were several factors that entered in besides the issue of slavery, but Lincoln, as well as many of his cronies, chose to use it as a primary reason for war. In another interesting statement, Lincoln said, “In doing this there needs to be no bloodshed or violence, and there shall be none unless it be forced upon the national authority. The power confided to me will be used to hold, occupy, and possess the property and places belonging to the Government and to collect the duties and imposts; but beyond what may be necessary for these objects, there will be no invasion, no using of force against or among the people anywhere.” Unfortunately, he failed to uphold this promise. The final words of his speech are hauntingly memorable, yet ominous in their warning, and a last plea to refrain from hostility went unheeded.